New Mac(s aapl) owners don’t often know things about their computers that might prove otherwise helpful, like exactly what model they have (is your iMac the early-, mid- or late-2009 version, for example) or how much RAM they have installed. Luckily, OS X Lion organizes that info in a slightly better way, and there are also web and app-based tools to help learn all the intimate details regarding their machines. Right in your computer’s Apple menu (under ? 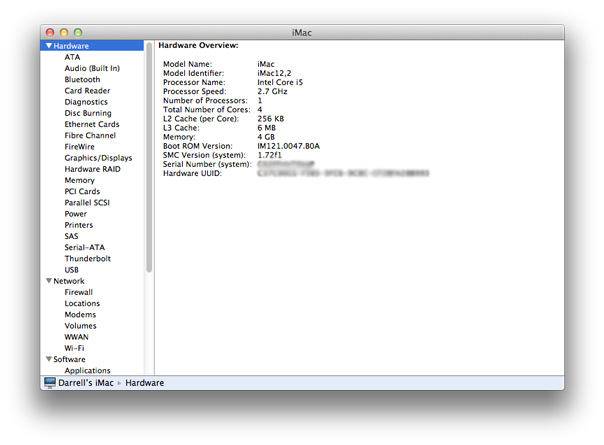 ), the first item in fact, is the “About This Mac” utility. Clicking on it will bring up a small window that prominently says which version of Mac OS X you’re running, which processor your system has, how much RAM, and the name of the startup disk (the drive the computer boots from). There are two clickable buttons in this window: one takes you to Software Update, and the other, which we’ll be using, is labelled “More Info…” and takes you to the System Information app. 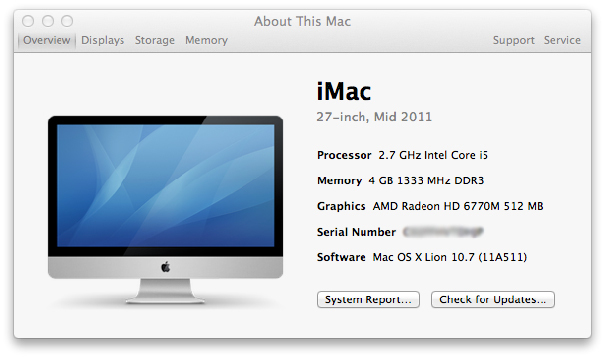 The System Information app provides you with the type of Mac you’re using (iMac, MacBook Pro, etc.) and also the specific size and original release timeframe of the computer. In the screenshot below, you can see that I’m using a 27-inch iMac from mid-2011 here. Other information provided on the “Overview” tab of the System Information app includes your processor speed and type, the amount of memory or RAM installed on your system, the graphics card your computer has, and the machine’s serial number and operating system version. Listed along the top of the System Information window are different tabs where you can find out more. 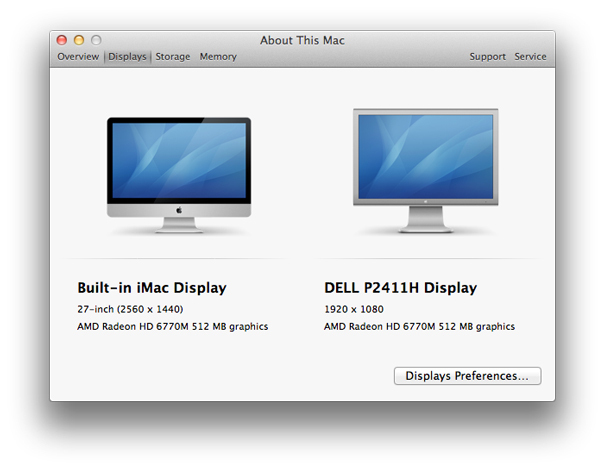 “Displays” shows you the number and type of screens currently being used by your Mac, including the built-in display and any external monitors you have connected. 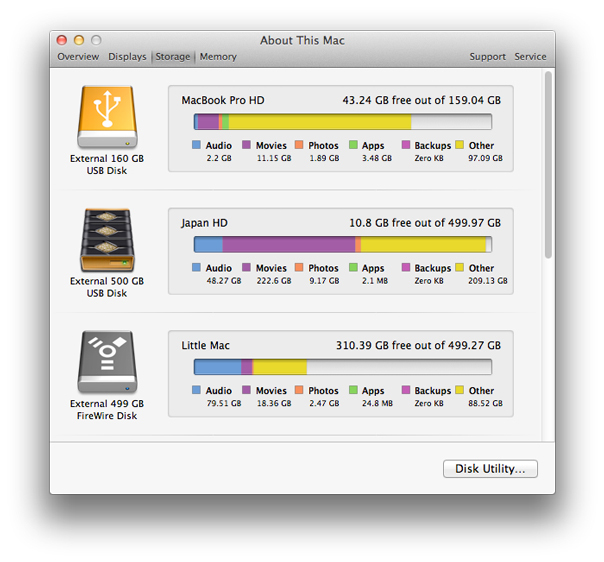 “Storage” provides a breakdown of any drives either connected to or built-in to your Mac, including a visual breakdown of what type of content and how much of it can be found on each drive. 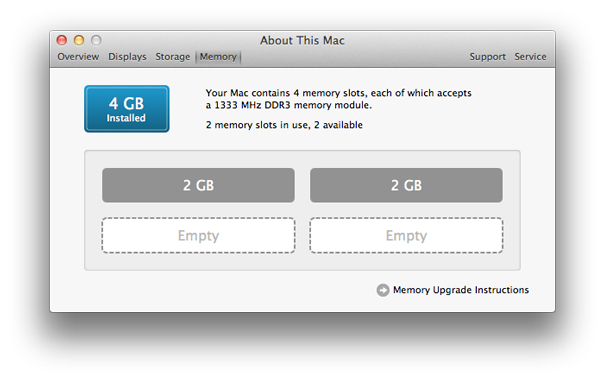 “Memory” tells you how much RAM you have installed, and lets you know if you have any free slots available for more. You can also access Memory Upgrade Instructions from this tab for your specific model of Mac, if the memory is user-upgradeable. 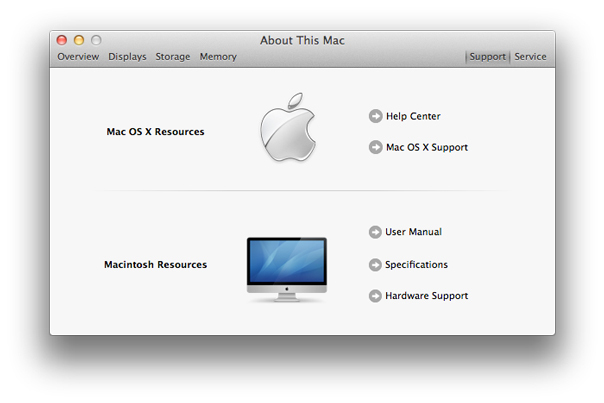 Also available from the System Information app are Mac OS X and Mac hardware support resources, under the “Support” tab listed in the far right upper corner of the window. These provide useful links to Apple’s online help database, support contact information, and user manuals and specifications. 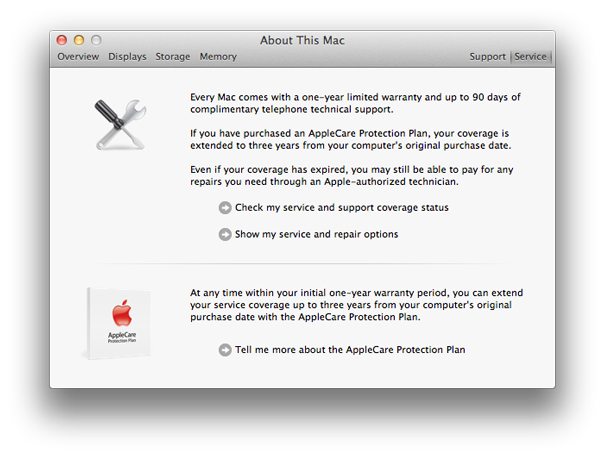 You can also check whether your Mac is still eligible for service, and check your authorized repair options under the “Service” tab. Back under the Overview tab, you can click “System Report…” to get a more detailed look at your system and the hardware installed, but for most users, what you need to find should be listed in one of the tabs mentioned above. If you’re still curious about your Mac or any other Mac out there, then there are a couple useful resources you can check out. 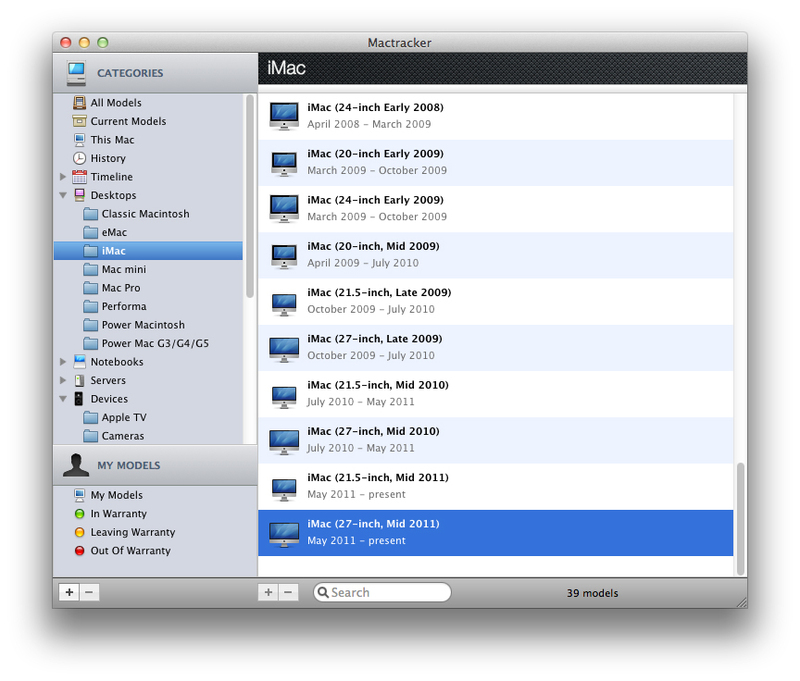 Mactracker is an app on the Mac App Store that’s available as a free download. You can use it to browse or search for any Mac model ever built, as well as Apple-made peripherals, iOS devices, servers and even discontinued product like the Newton. It’s like a virtual Apple museum that’s both searchable and customizable. EveryMac.com offers similar information, but in a website instead of in an app. It’s a little bit harder to navigate, but once you find what you’re looking for, it provides much more detailed information, including lengthy contextual descriptions of the Macs themselves, as well as Geekbench performance comparisons, and links to helpful articles about specific components and their uses. For a lot of people, the motivation for moving to Mac can be that users simply don’t want to think too much about the system they’re using — hence Steve Jobs’ affinity for the phrase, “it just works.” But knowing at least the basics about the system you’re using means you’re that much likely to be able to handle problems well when they do occur. For most people, all that means is opening System Information once in a while to refresh your memory. 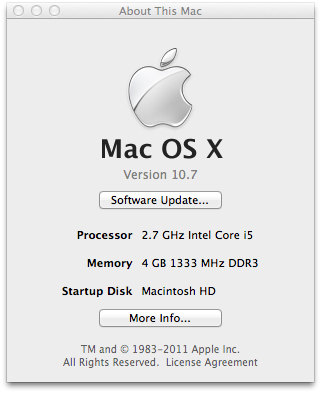 For others, though, the deeper dive provided by Mactracker and EveryMac.com will be a rewarding experience.